a whole new dimension (for the basic set) I bought this with the Seafarers expansion thinking they went together (they don’t — it’s for the basic game). So anyway, we decided to try Fishermen before we tried Seafarers. Fishermen is so fun and accessible that we’ve barely even tried that other one. You’d be surprised how much it adds to the game play. If you have a settlement or city on a fish tile, you pick a random fish token when the proper number is rolled (just like resource production). This fish token can either have 1, 2, or 3 fish on it. Once you collect a few of these, you can ‘spend’ them for things like moving the robber, building roads, etc. (You can trade them too!) The instructions tell you to put the tokens face down on the table to draw randomly, but keeping them in a bag works much better (we keep ours in an old Crown Royal bag!). Just watch out for “the Boot”! If you catch it, you need an extra point to win.Happy fishing! These Rock! 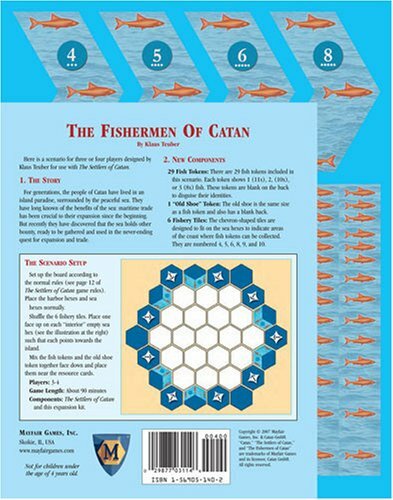 This is the best of the Settlers of Catan add-ons. It features fish tiles that go over the blank ocean squares. Thus, if you’ve built on that square and roll the card’s number (say a 6) in addition to all your resouurces, you get…fish! They’re redeemable for tossing the robber back to the desert, and even roads and development cards. Makes worthless spaces much more useful and adds a great dynamic to the game.